Voting and elections: All Seattle public schools will hold mock elections every November in a manner that befits each school, just as they do in the Plano, Texas School District, which has had city-wide student elections since 2008. King County Elections and the Sec. of State’s Office in Olympia have committed to assist in this great endeavor. All K-12 schools will encourage students to register family and community members to vote. Social studies will lead civics education revitalization: Civics/politics perspectives will become a recurrent, intentional point of reference in all K-12 social studies classes. Three civics CBAs (classroom based assessments) will be completed at each grade level. (Currently, only one civics CBA is required in grades 5,7, and 12.) The political spectrum banner will anchor all secondary SS classrooms. Media-literacy instruction, especially related to electoral politics and current events, is a required facet of this initiative, primarily in social-studies and language-arts classrooms. Puget Sound Off, the award winning website, is a key media tool for personalized civic engagement. Civics Across the Curriculum / Civics Across the Core: All K-12 teachers will be trained to infuse inter-disciplinary civics lessons, “civics awareness,” and civics texts that support Common Core literacy standards into all grades and all disciplines whenever efficacious. All K-12 classrooms district-wide will feature the “Essential Civics Questions” banner to facilitate the integration of inter-disciplinary, civics-embedded, lessons and units. Civics website page: The District’s website/Fusion page for K-12 Civics Across the Curriculum will maintain sufficient capacity to provide teachers with methods and lessons to share and infuse civics lessons across all curricula. Professional Development: 2.0 PD days in year one will be dedicated to teaching civics “across the K-12 curriculum.” The formation of a common instructional language and framework that connects all grades, teachers, and other employees is central to Civics for All’s objectives. — Aristotle, Politics, 340 B.C. 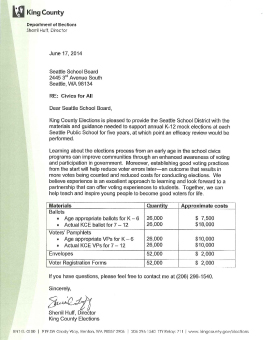 Voting and elections: All Seattle public schools will hold mock elections in a manner that befits each school. 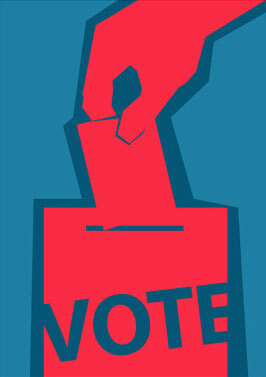 Because research proves youth voting increases citizenship aptitudes for life we must teach kids how to vote from K-12 . All K-12 schools will encourage students to register family members and others when feasible and high school social studies teachers district-wide committed in the fall of 2012 to a shared effort to register all seniors in Seattle public schools. King County Elections and the Sec. of State’s Office in Olympia have committed to assist in this great endeavor, just as their counterparts in Plano, Texas have done since 2008 with that city’s District-wide student elections. Social studies would make civics perspectives a constant, intentional point of reference in all K-12 social studies classes. The emphasis on alignment with Common Core Standards in History/Social Studies and English/Language Arts Reading and Writing will predominate. The initiative calls for three civics CBAs (classroom based assessments) to be completed at each grade level – this is the central improvement of the proposal. For more info on CBAs click here and here. It is understood that the wide majority of social studies classes would do one of the CBAs each October/November as an “Election/Voting” CBA, leaving two Civics CBAs for the remaining 8 months of the school years. At the grade 6-12 level the “ Political Spectrum” banner would be posted on all SS classroom walls (41 SSD high school social studies teachers have already hung this banner in their room). The Essential Civics Questions banner will hang in all K-12 classrooms but it will get most use in the social studies, where the expectation will be that teachers will identify and infuse at least 2 essential questions into each unit plan, aside from and beyond the CBA’s. Also encouraged: a) more intentional coverage of current events, including elections; b) more regularity in use of service learning lessons – when outside-classroom community and political engagement activities are unfeasible, in class “policy-based service learning” activities are an excellent alternative. Four programs that district elementary classes use now on an ad hoc basis — iCivics, Project Citizen, Storypath and We the People —would be drawn from and used in an intentional manner as befits each school’s preferences. Media-literacy instruction: Media-literacy, especially related to electoral politics, will be a required objective, primarily in social-studies and language-arts classrooms. Current events coverage, from organizations like CNN Student News (5 min. daily segments available, no cost) and others would occur frequently to merge civic literacy with media-literacy via current events. Civic literacy is unattainable without media literacy. Great lessons like these can help immediately. Seattle is a nationally recognized hotbed of civic media education initiatives – there are boundless opportunities for growth and partnerships in this area. 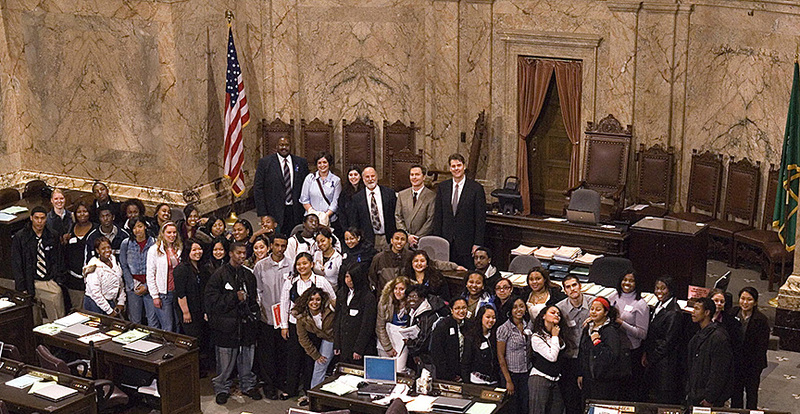 Puget Sound Off, the award winning website, is a superb tool for teachers to use to cultivate civic engagement for youth in areas of personal interest. Civics website page: A periodically updated portfolio on the District’s website Fusion page will provide teachers with lessons, methods, and ideas to share and infuse civics and current events into each K-12 grade and discipline. This website would be the hub of civics education and action for the entire district. It would play a major role in data aggregation and analysis during K-12 mock elections. Professional Development: The Initiative calls for 2.0 PD days in year one of teaching civics across the K-12 curriculum, 1.0 in year two, and .5 in year three. All SSD teachers and staff (from custodians to the Superintendent), as well as parents and older students, will be encouraged and expected to be conversant with commonly framed main principles of democratic citizenship. Click here to download the Professional Development Day One proposal. Also, to the extent possible, staff will be reading and discussing four brief, core texts: The Guardian: The Civic Mission of Schools and Advancing the Civic Mission of Schools, both from Justice O’Connor’s Campaign for the Civic Mission of Schools; The Role of Civic Education, from the Center for Civics Education; and The True Patriot: A Pamphlet (Liu and Hanauer). The Annenberg Foundation’s “Democracy in America” video course will also serve as a core civics text that helps all school employees participate in civics instruction, the cultivation of civic awareness on campus, and the development of a common instructional language that connects all grades and teachers. Everything you need and want to know about registering is either here or it is here! Learn who can vote, how to register to vote, and how voting works. Building on current strengths and successes. Seattle school district teachers are the most important group in making the Civics for All proposal successful. Many already infuse civics lessons far beyond current requirements. Given the opportunity, with our amazing students, and our civic support network, Seattle’s superb teaching corps could easily turn the city into a civics-education model for the nation. Teacher-friendly and student-centered. The proposal is minimally prescriptive and gives teachers options for infusing civics into their current or new units. At the most basic level, students love civics lessons and political debates and when this passion is enkindled students succeed as scholars and as citizens. When students succeed, teachers succeed. Teacher agency, or efficacy, which has been battered since 2000, increases dramatically when student achievement increases. Teacher buy-in. Local and national education experts realize that successful education initiatives must cultivate buy-in by teachers, collaboration with colleagues, and respect for traditional course-work. Civics for All has received excellent buy-in from high school social studies teachers and others so far and is now working with the SEA (Seattle Education Association) to conduct a District wide awareness campaign and survey about Civics for All later this spring. Teacher support for the initiative is essential to providing the very best citizenship education possible for all of our students. Addressing stress. Our teaching corps is overworked and stressed by overloaded classes and an ever lengthening list of standardized tests to “prep” students for. The new state teacher evaluation law includes formulas whereby student achievement on such tests can affect teachers’ job security. It is likely that some teachers will be reluctant to support a proposal that could take precious class time away from preparing students for the tests, including further new assessments that are likely to come out of the Common Core State Standards adoption. How much standardized testing is too much? A timeless civic issue. Forging ahead. Meanwhile, however, we cannot afford to let the ongoing debate about standardized testing distract us from the immediate task at hand: improving civics education for all 48,500 of our students. The proposal was written with these realities in mind. Civics for All does NOT call for a prescribed civics curriculum and test-based assessment regimen. Rather it calls for: district-wide touchstones, including “Essential Civics Texts” and “Essential Civics Questions” which will help all students and teachers increase civics connections between their classrooms. Civics for All respects teachers to make the right adjustments as to where, when, and how they infuse civics connections. Time spent on civics connections increases student focus/productivity and can make the time issue a wash.
“Math class is still math class” and “Spanish is still Spanish,” when civics is taught across the curriculum. Civics for All is designed to increase teacher agency and free them to help their students make connections that spark understanding – and success. Many teachers in non-social studies disciplines already make abundant civics connections in their classes, including science teachers who, when studying environmental issues follow RCW.28A.230 and WAC 180-50-115 to “provide interdisciplinary…social studies and humanities” (sic) perspectives. Big picture frameworks for understanding like Essential Texts, Questions, and Tensions are useful, as are the easily produced connections to current events and issues (i.e. Math – Electoral College projections, etc. and Spanish – immigration issues, Latino vote, etc.). Further examples are in the PDF below. Seattle school district administrators support civics and already recognize the imperative of high quality, K-12 civics education. They want to give teachers the support and classroom time needed to help all students become active and engaged citizens for life. Remember: No one questions that excellent instruction is the key to student learning. Yet few question and consider the corollary: Doesn’t content selection crucially affect student learning as well? We know that it does, but much of K-12 curriculum remains static, status-quo bound, and boring to many or most of today’s students, no matter how well it is taught. Civics infused lessons that invoke political and ethical thinking can turn that tide and ignite student learning, and make the old new again for students.